In developing our proposal for this initiative, we were guided by the notion that resiliency can and should be a core feature of social structures and processes. That is, threats to resiliency are found not simply in conditions such as low lying coastal communities or lack of back-up energy generation, but also in social disconnection and impaired flows of key resources. We were already aware of some of the vulnerabilities of this particular community, as well as its strengths in that it is well-organized and has a considerable density of social services and community organizations. That said, even when there are such assets in a neighborhood, there are many examples of municipally-sponsored projects that by-pass or fail to fully honor existing assets and networks in a community, with results ranging from missed opportunities to actually leaching resources (including time and trust). 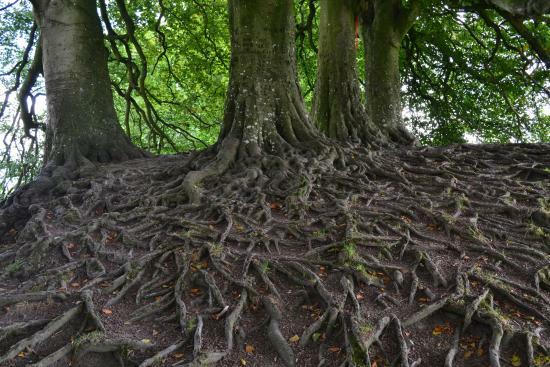 Years ago, author and activist Jane Jacobs wrote in The Nature of Economies how crucial diverse and intricate networks are to resilience and prosperity in social systems. Unfortunately in some communities these means of leveraging “transient energy” (money, information, material goods) are either underdeveloped or overwhelmed. The operating metaphor here could be extreme rainfall that, because of poor soil quality and/or the intensity of the event itself, overcomes the capacity of that soil to absorb nutrients and perhaps carries resources away through run-off. What this suggests is that a diversity of structures are key to capturing, recycling and creating value. Accordingly, our work of the past several months has been to help establish and support a set of interconnected teams (see image below) that each fill a unique function and collectively slow down what might otherwise be an overwhelming storm of information and rapid-fire meetings. These teams are meant to serve as a kind of root structure that helps hold the community soil together around this project, capturing value from and adding value to the flows of technical information gathering and dissemination. Project Management Team – This convening team, including city agency staff, the engineering firm and our team, creates and monitors the overarching structure and processes (including calendaring and logistics) that yield project deliverables. 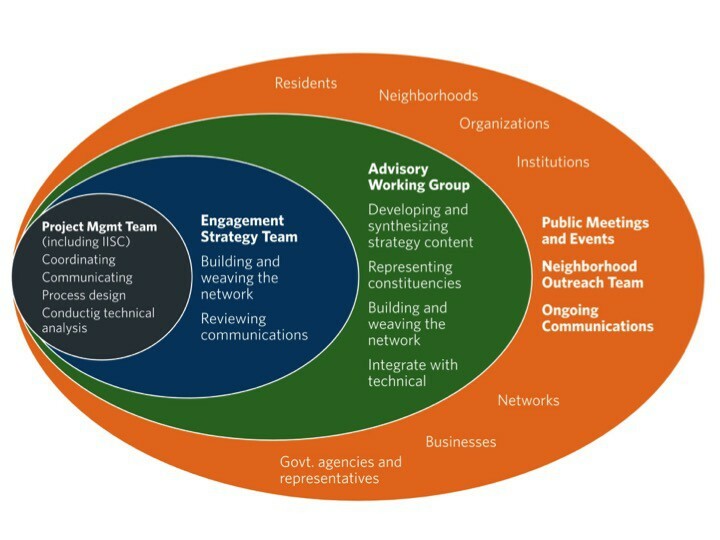 Engagement Strategy Team – This team of roughly 10 members of local community organizations and businesses works to refine and oversee implementation of the Stakeholder Engagement Plan to ensure robust engagement throughout the process, including input into key technical deliverables and incorporation of resiliency knowledge and skills into local programming (education, workforce development, cultural outlets). Advisory Working Group – The so-called “AWG” is a larger 35-40 member body of local nonprofit, business and government leader, who give strategic input into key technical deliverables that inform the selection of priority resiliency projects by the city. 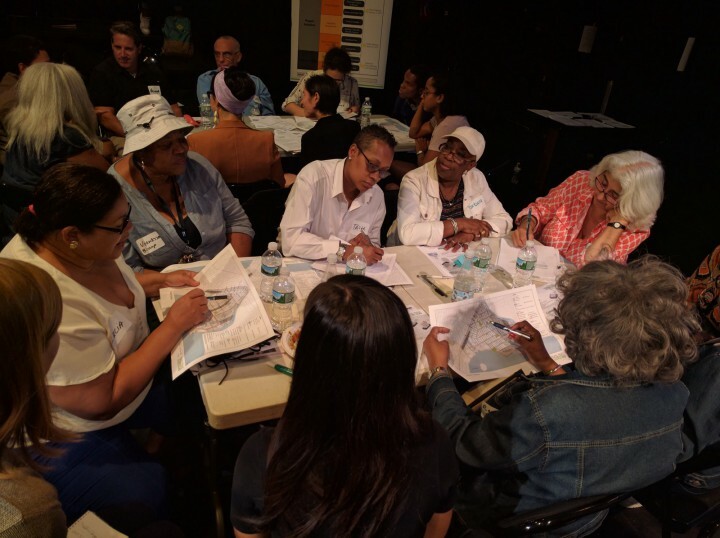 Neighborhood Outreach Team – The 10 members of this team receive a stipend to undertake extensive, intentional and targeted outreach and education activities to gather and amplify public voices at the neighborhood level through innovative means both in-person and digitally. Very importantly, this includes considering which groups/residents are most marginalized/disengaged in the community and/or those who would most benefit from engagement, how to engage them and best practices for outreach and connection, as well as helping to ensure that engagement activities are mutually beneficial for resiliency projects and for those who are engaged (with respect to social connections, education, training, etc.). Public Meetings – These regularly scheduled and open meetings are meant to convey project related information and gather public feedback relative to key decision points around project deliverables. Of course, structure is only part of the story, and there is more to be said about process, including guidelines for designing and facilitating various kinds of engagement, as well as keeping robust and accessible communication flowing about different aspects of the project. For more, see Public Engagement for Resilience, Part 2: Focus on Process.